A groundbreaking plan to cleanse your system and revitalize your health. Award-winning author and detox expert Ann Louise Gittleman, Ph.D., CNS, America's "First Lady of Nutrition," has an unbeatable track record in helping people to identify the "hidden invaders" that may be sabotaging their health. In her groundbreaking "The Gut Flush Plan," she focuses on the next frontier in health care-the new germ warfare- designed to outsmart the hidden invaders and superbugs that are spreading into the community and threatening our health-making us sick, tired, and bloated. 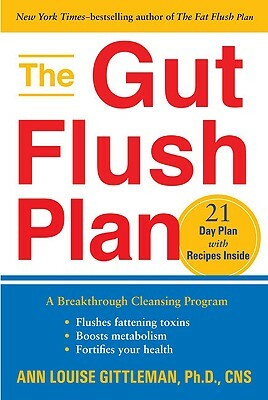 * and, with Gittleman's 21-Day Gut Flush Plan, replete with menu plans, irresistible recipes, and shopping lists, you'll discover tantalizing new foods and delicious herbs and spices that enhance immunity and reduce intestinal distress.